There’s no need to buy expensive bows to dress up your Christmas presents or birthday gifts – simply save your Christmas cards and other greeting cards, then choose one with the colors that you like and make one of two simple bows. Either of these bows makes a beautiful gift-wrapping embellishment. Put both bows together, however, and you have a one-of-a-kind, luxurious decoration for any packaged gift. For each bow, you will need to cut eight strips from the front of your chosen card. On the blank side of the card, measure eight strips, each 3½ inches long and ½ inch wide. Mark the measured lines with a pencil and cut out the strips. To make the spiral bow, take one of the card strips and bend it over lengthwise, forming a loop by pinching the two narrow ends together with your fingers. Be careful not to fold the strip so severely that you get a fold mark at the center point; all you want is to pre-form a rounded loop so that the card strip will tend to stay in this shape as you continue. Do the same with a second strip. Apply a small amount of white or tacky glue to the upper surface of the lower end of the first strip. Overlap one end (about 1/4 inch) of the second loop and pinch together until the glue holds. You now have one long strip, glued together in the middle. Apply more glue to the center point, and bring over the end of the first strip, overlapping the end of the opposite strip below; pinch together until the glue holds. Repeat with the final end of the last strip, until you have a straight piece of card that is looped at both ends, as shown in photo, above left. Make three more looped strips in the same way. Glue two of the looped strips together, at right angles (forming a cross). Make another cross from the other two loops. Glue the two crosses together on an angle to form a spiral bow. Cut a ¾ inch circle (tracing around an American or Canadian penny works well). Finally, glue the circle in the center of the spiral bow. The starburst bow is assembled in a similar way as the spiral bow, but the individual loops are cut on both sides to create the starburst effect. Take one of your card strips and cut with scissors, as shown by the red arrows in the photo at left. Begin the cut at one end corner and curve it inwards about 1/8 of an inch, extending the cut for about two inches, or just past the halfway point. Repeat the cut on the other edge of the card strip. Take the center part between the two cuts and gently bend it underneath until it meets the other end. The two cut sections will extend as spikes beyond the bowed section, creating the starburst effect. Take a second card strip and make it just the same as the first. Overlap the uncut ends of both strips and staple together in the middle to make the first spine of the starburst. Repeat the previous steps to make three more spines. Fasten the spines together at the center, with glue or double-sided tape, creating a starburst effect. Cut a 1¼ inch circle from matching card (I cut my circle with decorative edge scissors, but a plain circle will work too). Glue this circle in the middle of the starburst to complete the bow. Use a strip of double-sided tape, or a small loop of scotch tape or sellotape, to stick your bow to a wrapped gift. 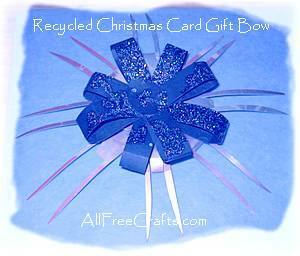 If you have lots of greeting cards available for recycling, consider making a luxurious combination bow. Choose cards with complementary or contrasting colors, and make one spiral and one starburst bow. When completed, glue the spiral bow on top of the starburst to make an eye-catching combination bow of striking depth and texture.